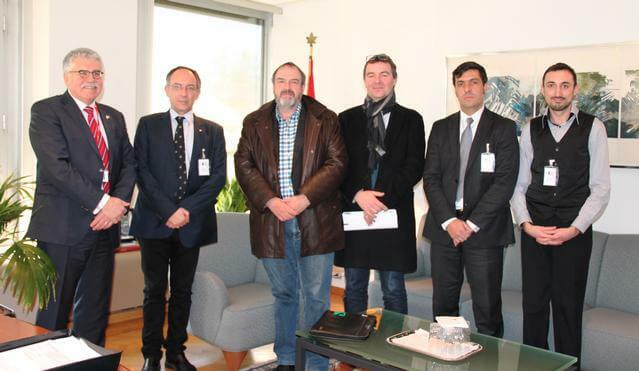 On 18 February 2015, a delegation led by ETF General Secretary Eduardo Chagas met with Mr David Plunkett, the Canadian Ambassador to the European Union to raise concerns about the EU-Canada Comprehensive Economic Trade Agreement (CETA). During a two hour-long discussion, the union delegation, which included representatives from the Belgian affiliated organisations ACV and BTB, drew the Ambassador’s attention on a number of provisions contained in CETA which risks jeopardising jobs and regulations on both sides of the Atlantic. The meeting gave the ETF the opportunity to cast a critical eye on the ability of the EU-Canada free trade agreement to realise the many expectations raised in terms of job creation. The ETF fears that the business-oriented strategy that guided the negotiations is not only going after the alleged barriers to trade but also after the trade-union and social rights. Proofs of that are the creation of the Investor-State Dispute Settlement (ISDS) or “regulatory mechanisms” which would seriously limit national governments sovereignty and the democratic scrutiny of economic policy. In addition, ETF asked for the exclusion of a specific chapter on maritime transport services which would threaten domestic cabotage arrangements in Canada. Instead of deconstructing these arrangements, it should be the European lawmakers’ duty of care to look at providing similar measures in Europe to protect EU-based seafaring jobs and the EU maritime know-how, said the ETF. After Mr Plunkett committed to relay the ETF concerns to the Canadian government authorities, the ETF concluded by reiterating its solidarity towards the Canadian Maritime and Supply Chain Coalition that was formed in response to the detrimental effects that CETA will have on the Canadian maritime industry and the rest of the logistic chain.